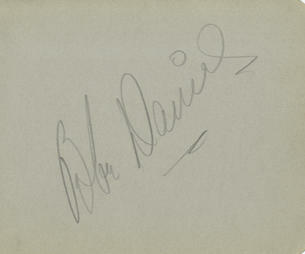 This is a Hand Signed Autograph album page 4.75" x 3.75" in pencil by the late American actress. Bebe Daniels (January 14, 1901 - March 16, 1971) was an American actress, singer, dancer, writer and producer. She began in Hollywood during the silent movie era as a child actress, and later gained fame on radio and television in England. Throughout her life, Bebe Daniels made over 230 films.